Collisions between cars and trucks are often devastating, to the occupants of the car. 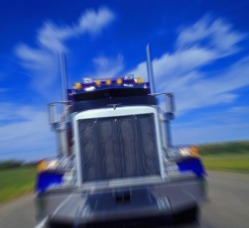 Fatigue is a major factor in truck wrecks. Year after year, large trucks are involved in thousands of crashes, and between 4,000 and 5,000 deaths annually in the U.S. By a wide margin, the fatalities are occupants of other vehicles as opposed to truck occupants (greater than 6 to 1). Poor driver performance, including fatigue, is a major contributing factor, as is the unsafe condition of many trucks, particularly their braking and steering systems and tires. Great economic pressure to drive long hours. Interstate truckers struggle with fatigue, confusion on strange roads, longer stopping distances, and large blind spots that require extra caution. They have special obligations when parking on the side of the road, must keep a driving log, and must be aware of curves that could cause a rollover. They must check their loads to avoid objects falling onto the roadway, and they must be aware of blown tires that can dangerously litter the roadway with treads. It's hard to be a trucker, but that is why they revel in the title "professional driver" and why they are held to a high standard of conduct. The National Transportation Safety Board studied alcohol and drug involvement in heavy truck accidents in which the drivers were killed; 33 percent of the victims tested positive for drug abuse. These drivers had consumed alcohol, marijuana, cocaine, over-the-counter stimulants, opiates, PCP, or a combination. In addition to DWI, the study indicated that these drivers were also more likely to violate other laws. They were more likely to have prior alcohol or drug histories, were more likely to violate federal hours of service regulations, and more likely to drive with suspended or revoked licenses. The U.S. Department of Transportation responded to the dangers posed by DWI in commercial vehicles through changes in the uniform Commercial Driver License (CDL) requirements in Title 49 of the Code of Federal Regulations. 49 CFR prohibits commercial operation with a BAC of 0.04 or greater. Regulations prohibit driving within four hours of consumption of any alcoholic beverage. Commercial drivers in Texas are put out of service for 24 hours if there is any detectible alcohol in their system. DOT has instituted a mandatory drug testing program among motor carriers, who are required to randomly drug test 50 percent of the average number of interstate operators each year. All 50 states have incorporated the federal regulations into their state motor vehicle laws, thereby making them enforceable by authorized law enforcement officials at the state level.